The intent of this countdown was for it to be diamonds and only diamonds...but really, it just wouldn't be complete without one of the most symbolic pieces in the queen’s collection: the George IV State Diadem. 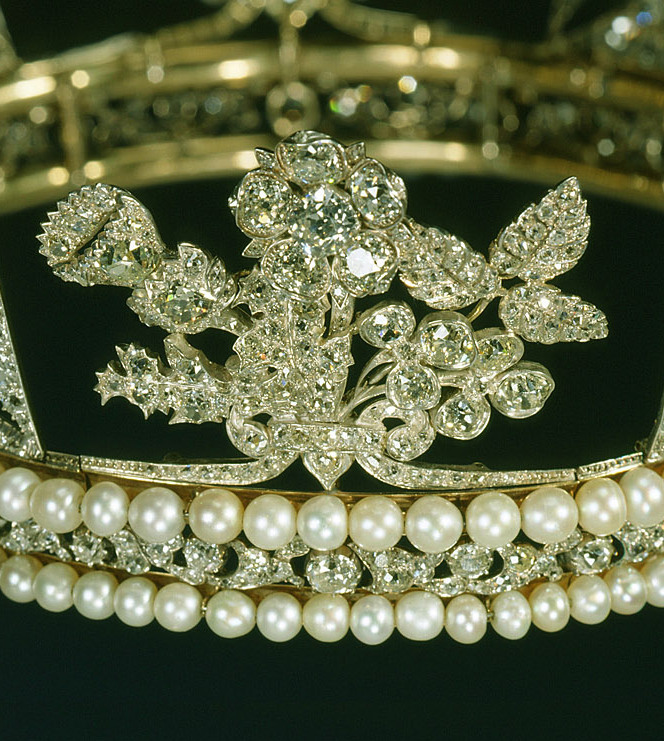 Made by Rundell, Bridge & Rundell (and likely designed by their designer, Philip Liebart) in 1820, the diadem features a set of 4 crosses pattée alternating with 4 bouquets of roses, thistles, and shamrocks. The motifs are set on a band of diamond scrollwork between two bands of pearls. Queen Alexandra had the diadem made smaller in 1902, reducing the top band of pearls from 86 to 81, and the bottom band from 94 to 88. The front cross is set with a 4 carat yellow diamond, and the piece features 1,333 diamonds in all. 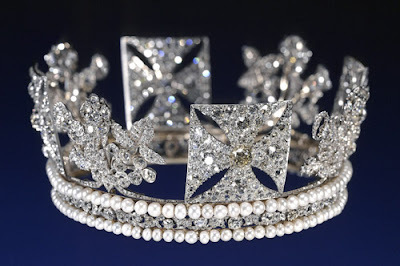 This is "officially" called the Diamond Diadem - but since we talk about so many tiaras that could fit that name, I've chosen to use a more descriptive name here. This is a unique item in the queen’s collection for a few reasons. 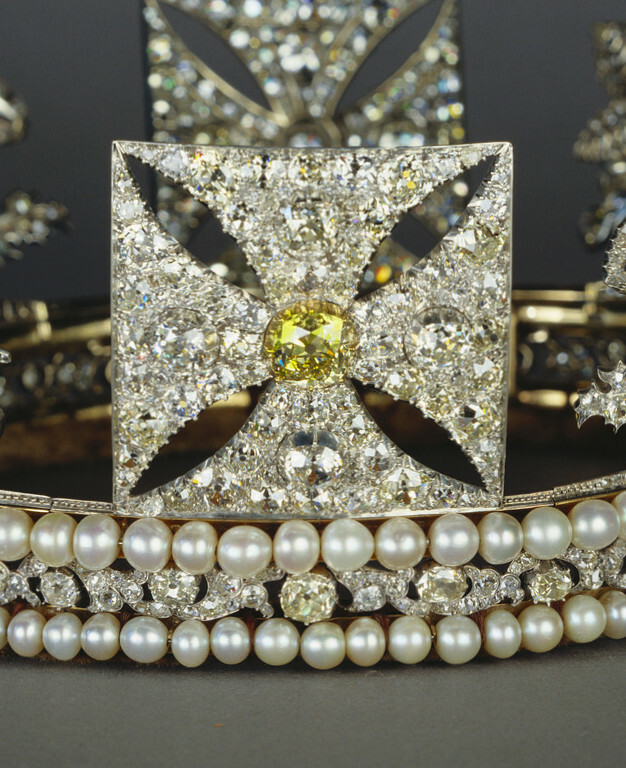 First, it dates from prior to Queen Victoria’s reign – and beyond the regalia of the Crown Jewels, there aren’t many things in use that have such a history. Second, and despite the fact that it is exclusively worn by queens now, it was actually made for a man: King George IV. To commemorate the relatively recent creation of the United Kingdom of Great Britain and Ireland, George came up with a new motif: a bouquet of Scotland's thistle, England's rose, and Ireland's shamrock. He actually wanted to use this “patriotic device” to replace the fleurs-de-lys on the crown – the French monarchy had fallen, and England had basically given up its claims on France – but he was shot down by the College of Arms, which pointed out that the French motif had existed longer than the claims on France had. So he used it on this diadem instead, which he wore over a plumed velvet hat to his coronation in 1821. Initially, the stones for the diadem were only hired for the coronation – a common practice until Queen Victoria’s time. Obviously, they’re permanent now; since the delicate settings don’t show any sign of disruption and there’s no record of the stones being purchased, the Royal Collection speculates that this might have been achieved with a trade of some sort. Queen Elizabeth II started wearing the diadem after her accession in 1952. Unlike some of the ladies before her, she has left it to state occasions: she wears it to and from each State Opening of Parliament and for official portraits, and that’s the extent of it. But that combination of uses has made it one of the most recognizable symbols of her reign; on her head, it adorns stamps, money, and more official images. 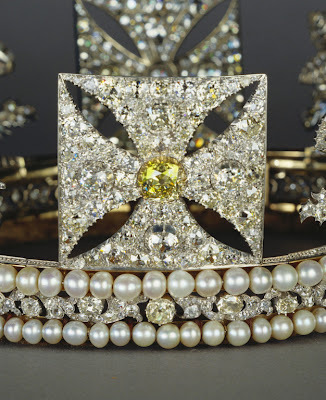 Combined with the uniquely extensive history and the overt symbolism of this piece, the fact that it is such a symbol of Queen Elizabeth’s reign puts it at number two on my countdown of her ten best diamonds – pearls and all. 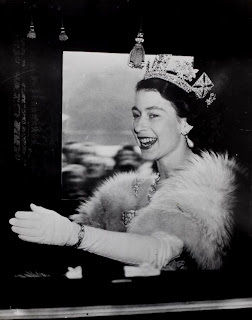 Click here for the rest of Queen Elizabeth's Top 10 Diamonds.